All transactions are safe and secure with a reliable history in online purchasing behind each of our associates. 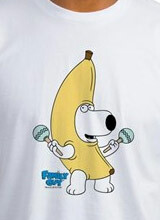 Buy Family Guy t-shirts including the Peanut Butter Jelly Time and the Family Guy Stewie t-shirt. 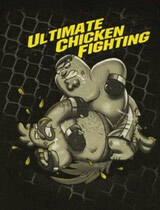 Created by Seth MacFarlane, the Family Guy cartoon premiered on FOX in 1999. The story is centered around the adventures of a Rhode Island family living in the fictional town of Quahog. 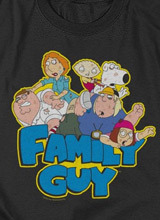 Below, you will find Family Guy t-shirts for almost every member of the Griffin household. 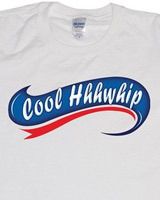 Popular tees include the Stewie t-shirt and the Peanut Butter Jelly Time Family Guy t-shirt. The family includes the father, Peter Griffin, a blue-collar worker who is employed at the Pawtucket Patriot Brewery. Peter lives with his wife Lois Griffin and their three children: Meg, Chris, and their extremely intelligent infant Stewie. 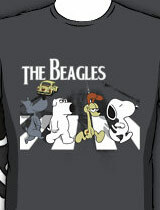 The family also has an anthropomorphic talking dog named Brian, who is Peter Griffin's best friend. The Family Guy cartoon often delivers its humor through short cutaway gags, which are short clips that poke fun at the story. 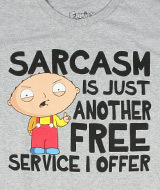 Here, you will find Family Guy t-shirts like Evil Monkey & Stewie Ts. Spank Me. I've Been a Bad Boy. 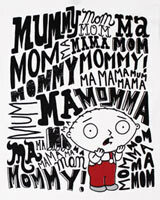 This red Stewie t-shirt lets everyone know that you've been misbehaving. 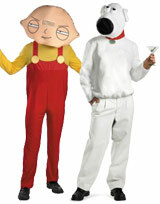 A Family Guy cartoon image of Stewie Griffin is displayed on the front, along with the quote, "Spank me. I've been a bad boy." The text wraps around Stewie, who is bending over waiting for his spanking. 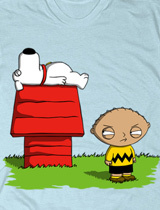 These Stewie t-shirts are perfect attire for peanut butter jelly time. Link to: Spank Me. I've Been a Bad Boy.